Find artworks, auction results, sale prices and pictures of Jeremiah Meyer at auctions worldwide. 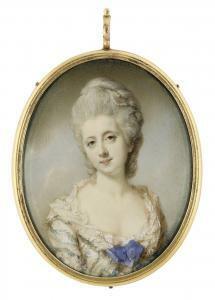 Jeremiah Meyer PORTRAIT OF JANE, DUCHESS OF GORDON(1748-1812), NÉE MAXWELL, CIRCA 1775 TÜBINGEN 1735 - 1789 LONDON Watercolour and bodycolour on ivory, gilt-metal frame, glazed reverse; later inscribed on the backing card 80 by 62 mm. 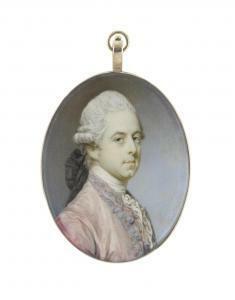 Provenance Sale, London, Sotheby's, 13 July 1982, lot 170 Catalogue Note Jane Maxwell, daughter of Sir William Maxwell, 3rd Bt., married Alexander, 4th Duke of Gordon in 1767. She was mother of Charlotte, Duchess of Richmond, Susan, Duchess of Manchester, Georgiana, Duchess of Bedford and Louisa, Marchioness Cornwallis. Sotheby's, London, 19 December 1977, lot 123 (as a young officer). 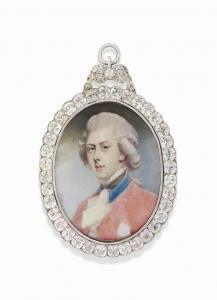 R. Walker, The Eighteenth and Early Nineteenth Century Miniatures in the Collection of Her Majesty The Queen, Cambridge, 1992, p. 131. A. P. Cunliffe, Esq; (\+) Sotheby\’\’\’\’s, London, 20 November 1945, lot 28 (as A gentleman called George, 9th Marquis of Huntly, £26 to Papier). Mikel Papier (1889-1948) Collection, and by descent. 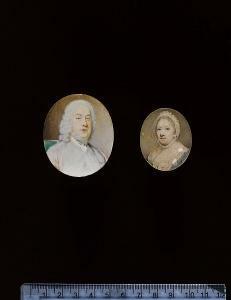 Watercolour on ivory, gold frames. This lot contains or is made of ivory. The United States Government has banned the import of any ivory into the USA. Jeremiah Meyer - An Unfinished Portrait Of A Gentleman, Seated On A Green Upholstered Chair, Wearing Blue-grey Coat And Powdered Wig. An unfinished portrait of a Gentleman, seated on a green upholstered chair, wearing blue-grey coat and powdered wig. by the same hand, unframed.